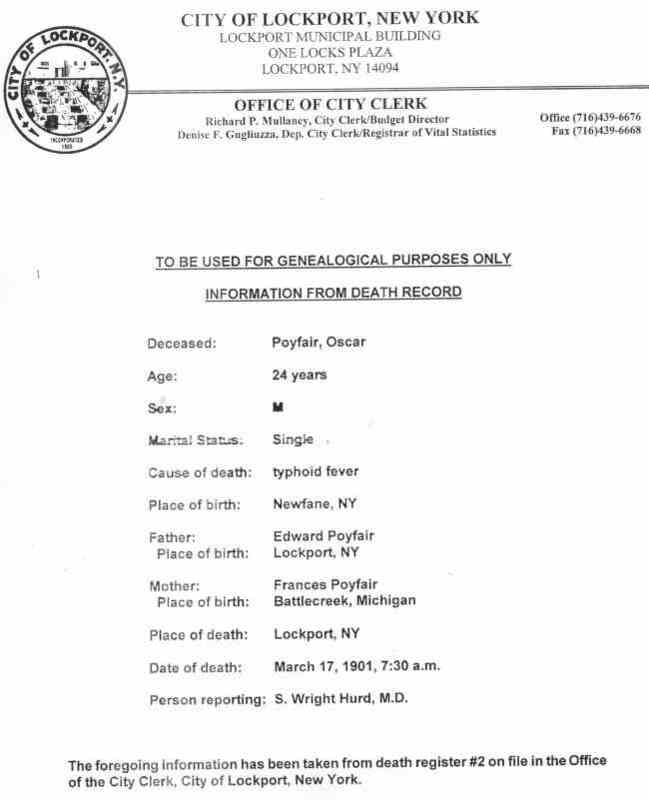 Edward Poyfair was the son of Jeremiah Poyfair and Ellen Flynn. For more on the family of Jeremiah Poyfair, press HERE. He was born on 13 April 1851 in Lockport, Niagara County, New York State. A document concerning this is found further down on this page. He was baptized on July 13 1851 at Saint John the Baptist Roman Catholic Church in Lockport. He died on May 11 1925 at 115 Market Street, Lockport. A document concerning this is found further down on this page. He was buried in Lockport's Cold Spring Cemetery. Edward married Frances Jane Walker in Chili, Monroe County, New York State. Francis Jane was born in Grand Rapids, Michigan, in May 1847. She died on March 21, 1933, at 65 Bellwood Av W, Seneca, Erie, N.Y. She was buried in Lockport's Cold Spring Cemetery. Mary Gertrude Poyfair, who was born on 21 July 1872 in Lockport, Niagara, N.Y. She married on 27 Sept 1893 at 360 North Adam St, Lockport, Elmer Tanner . She died on 1 Aug 1898 at 715 East Market St, Lockport. Ellen Flynn Poyfair, who was born on 29 Nov 1874 in Lockport. 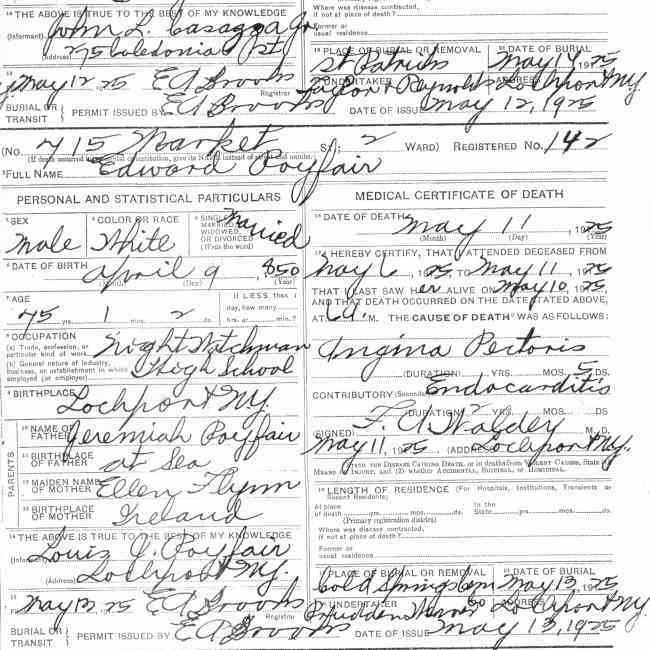 She married Frank Deci at 6.50 pm on 27 June 1900 at St James Episcopal rectory, Buffalo, Erie, N.Y. She died on 10 May 1946 in Our Lady of Victory Hospital, Lockawanna, Erie, N.Y.
Oscar Edward Poyfair who was born 7 March 1877 in Lockport. He died 18 March 1901 in Lockport City Hospital. A document concerning this is found further down on this page. Alice Ray Poyfair, who was born on 13 November 1879 in Lockport. She married on 25 June 1907 George Retallack at St Patrick's Roman Catholic Rectory, Buffalo. She died in March 1967 at Sisters of Charity Hospital, Buffalo, Erie, N.Y.
Louis Jeremiah Poyfair, who was born on 17 August 1882 in Lockport. A document concerning this is found further down on this page. Then an Iron worker, he married on 8 November 1908 at the First English Lutherian Church Rectory, Lockport, Alma Gardner, 20 years of age, who was born in Royalton, New York State, of the marriage William Gardner and Minnie Rowgon, both born in Bergholtz, New York State. A document concerning this is found further down on this page. Frederick Clifton Poyfair who was born on 30 May 1888 in Lockport. He died on 29 December 1925 in Lockport. Then a compositor, he married on 17 June 1914 at the Christ Episcopal Church in Lockport Anne M. E. Naylor, 21 years of age, who was born in Lockport of the marriage of John Naylor and Annie Chambers, both English immigrants. A document concerning this is found further down on this page. He died in Nov 1962 at Lockport Memorial Hospital. Ellen Payfair Daughter 5 . Oscar E. Payfair Son 3 . Alice Payfair Daughter 8M . 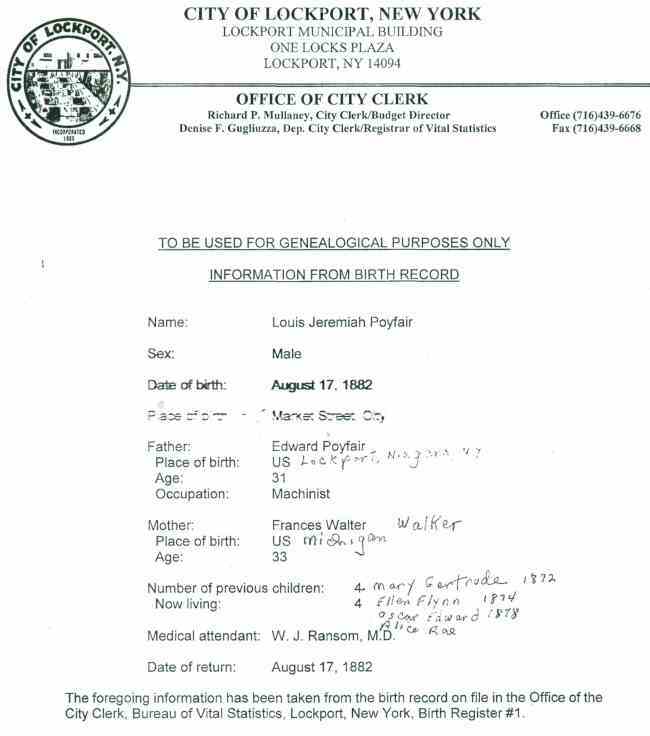 Edward and his family were then living in Lockport, Niagara County, New York State. His wife was born in Michigan; their children, all in New York State, and Edward also. To go back to the Home Page "Some Ancestors of Shirley Payfair Yaramo", press HERE.